Peonies are easy to grow, but planting depth is absolutely critical to flowering performance. If the eyes are planted too shallow or too deep, they may not flower. This is the most common mistake that is made when planting peonies and is most often the reason that peonies fail to flower. In all but the southernmost zones, peonies must be planted with their eyes 1 1/2 to 2 inches below the soil line. In the south, 1/2 inch should be sufficient. Space peonies 3 t o 4 feet apart. Mulch: Newly planted divisions, particularly those that are planted in late fall, should be mulched their first winter. Three to four inches of mulch may be required in northern zones to help prevent winter heaving. In the spring, pull mulch away from new shoots. Once peonies are established, winter mulch may not be needed. Fertilizer: Peonies should not be over-fertilized. Any complete garden fertilizer, not too rich in nitrogen, works. Rose food and conservative applications of bone meal are ideal for peonies. Fertilizer should be applied when the spring foliage is around 6 to 8 feet tall, place it around the drip line of the leaves. Over fertilization may reduce flowering. An annual topping of compost each Fall may be used instead of fertilizer. Planted too shallow or too deep. Over or undernourished. Peonies thrive with little care and limited amounts of fertilizer. Buds were killed by a late frost, disease, or excessive heat. Southern growers should plant early flowering cultivars. Not enough light for buds to form. Plants are too young or immature. Clumps are too large or overcrowded. They have been moved or divided too often. Plants were cut back before the foliage turned brown in the fall. Soil is too wet or too dry. Peonies require well-drained soil but also like to be watered down to the bottom of their roots. Let the soil dry out slightly between watering. Peonies require between 500 and 1000 hours of 32 to 40 F temperatures each winter for an abundance of flowers. Tree peonies (P. suffruticosa) differ from the garden varieties in that they have woody stems like a shrub. The branches do not die all the way back to the ground in winter as do the garden peonies. Their exotic, uniquely colored, and often fragrant flowers are produced in late spring, about 2 to 3 weeks before the garden varieties. When picking a site for tree peonies, they prefer rich, well-drained, neutral soil; and protection from harsh winds. If planting a group of tree peonies, allow at least 4 to 5 feet between them. Do not plant where peonies will compete with other tree roots; nor in areas that stay moist or are frequently watered. Excess water will suffocate the roots and is the leading cause of plant failure. Once established, tree peonies are drought tolerant plants. Choose a location with 4 to 6 hours of direct sun, or dappled sun/shade all day. Full sun makes the flowers fade rapidly and full shade may result in weak, slow growth. The first year is for getting established and it may not be floriferous, but the bud count will increase each year. Do not cut down tree peonies in the fall; the woody stems carry next year's flower buds. Allowed time and space tree peonies can grow quite large and live 50 years or more. The most critical aspect of planting peonies is correct planting depth. Grafted tree peonies should be planted so that the graft union (a bulge on the main stem) is 2 to 6 inches below the soil surface. The depth will protect it from freezing/thawing cycles, so plant 4 to 6 inches deep in northern zones. If planted correctly, the grafted plant will develop its own roots and the plant will be more robust as a result. Peonies should not be over-fertilized. Any complete garden fertilizer, not too rich in nitrogen, works. Rose food and conservative applications of bone meal are ideal for peonies. Fertilizer should be applied mid to late spring around the drip line of the leaves. Over fertilization may reduce flowering. Spring and fall toppings of compost may be used instead of fertilizer. After frosts, remove leaves to prevent any over-wintering of fungus. Do not cut the woody stems; flowers bloom on old wood. Newly planted divisions, particularly those that are planted in late fall, should be mulched their first winter. Three to four inches of mulch may be required in northern zones to help prevent winter heaving. In the spring, pull mulch away from plants. Once established, winter mulch may not be needed. After several years, the interior branches of the shrub may require pruning - for air circulation and flower production. Removing all but 6 to 12 of the strongest branches will help the peony flower more along its main branches and reduces fungus opportunity. If you experience damp, cold spring weather and leaf black spot appears in late spring or summer, remove heavily damaged leaves. This fungus may slow growth and should be dealt with early the following spring season. A copper spray or dust, sold in most garden centers, will prevent fungus that discolors the leaves with black spots later in the season. Tree peonies will grow with winter lows of 30's and 40's F. Try fooling Mother Nature by forcing the peony into dormancy. If leaves do not fall off by November, cutting them off will mimic the deciduous leaf drop and cycles the plant into producing new flower buds. Do not cut the woody stems, feed or water during this period. Herbaceous, intersectional and tree peonies, can be divided in fall like their herbaceous cousins. Only multistemmed tree peonies are divisible. Multistemmed tree peonies send up many shoots, so they can be broken up with a few stems to each division. Single-stem tree peonies have just one woody trunk, which can't be sliced in half. To divide a tree or intersectional peony, dig it up, put it under a tarp the night before cutting, and replant it after division, with its eyes 2 to 3 inches below the soil surface. The differences, however, crop up in the actual division of the plants. Easy, right? Just be aware of the differences between intersectional and tree peonies when it comes to the actual division process. Look intersectionals in the eyes before making divides. 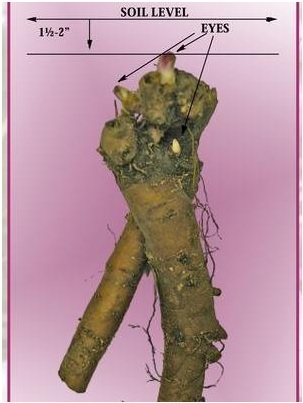 Intersectional, or Itoh, peonies (named for Toichi Itoh, their original propagator) can be cut apart at the most narrow connections between larger pieces of root, each at least 6 inches long. Cut the intersectional at a thin point between larger sections, as you would if you wanted just a bit of a large ginger root in the kitchen. As you visualize the cuts, remember that intersectionals send up new stems every spring, so they have eyes like herbaceous peonies do. Leave at least three eyes on each new division to ensure stems and flowers the following year.